please see diagram as this will show you basic link up procedures for the rotary evaporator . We have been educating & training our customers for years on how to properly integrate rotary evaporators with this process. We do not focus on low power packages that offer little to no recovery speeds. We’ve pioneered a rotary evaporator operating process that has made made progressive waves within the industry. What was once a long & arduous process of filling the flask & falsely spread information is now publicly corrected, here at Summit Research. 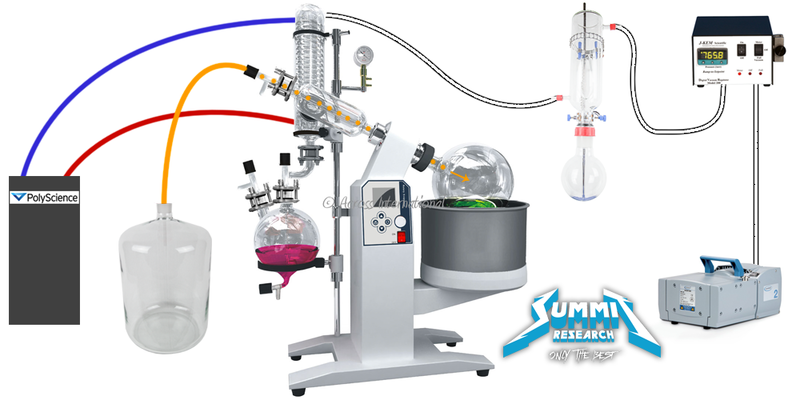 put rotovap together, remove all packing around coils with solvents, clean and make unit near sterile. connect cold output line from chiller to top of condenser coil body. connect output of condenser coil to the chiller return port. connect vacuum port from condenser to another trap(recommended to protect controller). connect trap to controller input. connect controller output to pump inlet. turn on rotovap, set bath temperature from 35-45c. turn on vacuum pump and set your controller to right above the cusp of the evaporation rate(generally 100mbar). allow both coil and bath to reach temperature while vacuum is set and equalized in system to set point. now set vacuum approximately 15-20% lower after everything has reached temperature. now allow the beginning of the evaporation process to occur. watch the discharge side, during this time you will se a rate of liquid recovery. start feeding liquid into rotovap slowly, match the inlet speed to the discharge side of the rotovap. what is coming off the condenser, should be 1-3% more than what you are feeding to rotovap. very important here – Dip the vacuum down as low as you can go, while watching both the condenser and the trap. Manage vapors to remain in the rotovap and not bypass the upper vacuum port. Ramping down vacuum should be done only after the initial dial-in is achieved as this will increase heat loads exponentially to the chilling system if not done correctly. allow the feed line to continually pull from a storage bottle of sorts. replace bottle as needed. this process can be ran nonstop until desired amount of goop is in the evaporation ball and the efficiency of evaporation is decreased. empty the solvent discharge ball at the bottom of condenser as needed through process. only empty evaporation flask when as needed. This is called batch feeding the rotovap, you will be able to achieve the fastest times possible with this process. Note that any weak or inefficient hardware will either over heat, or stop working properly if you choose to go down the route of using the wrong / mismatched gear. this process requires a inept understanding of how to operate nonstop and being able to match up the components. Summit Research has done a terrific job at pioneering this process and matching correct components up. if you require even faster speeds – please contact us for custom solutions we offer to large scale labs. questions on more advanced processes? Contact us or visit our showroom in Scotts Valley CA. to view the latest & most efficient innovations & exclusive equipment offers. I have been using your 20 L RotoVape and Autovac 200. It clearly states in directions and on website that the pump is to be plugged into it’s own power source and not directly into the Autovac 200. Being a vac controller, this will open and close the vacuum to the RotoVape, but not cut off the vacuum. I don’t understand how running the vacuum non stop is more efficient then plugging it into the controller. Why is that? The pump has to build up the vacuum that is released between pump and controller. Having the pump on the whole time keeps your vac levels where you want/need them to keep your best speeds possible in the roto.